UN Deputy Secretary-General Amina Mohammed adds her views to the Human Rights Graffiti Wall at the European Development Days event in Brussels, Belgium, 5 June 2018. The launch of a new partnership between the United Nations and European Union, is an essential tool to make violence against women and girls “a thing of the past”, said UN Deputy Secretary-General Amina Mohammed on Tuesday. Addressing a leading forum on development in Brussels, known as European Development Days, Ms. Mohammed said that the joint Spotlight Initiative was a key element for making Global Goal 5 on women’s empowerment, of the 2030 Sustainable Development Agenda, a reality. Now in the third year of working towards the Sustainable Development Goals (SDGs), the forum this year is shining a spotlight on gender equality. “Without equality and empowerment, we will simply perpetuate today’s paradigm: trying to address all the world’s challenges with only half the world’s assets,” said UN Deputy Secretary-General Amina Mohammed in her opening remarks. She painted a picture of women not fully included in decision-making, being subjected to a “global pandemic” of violence against women and girls. 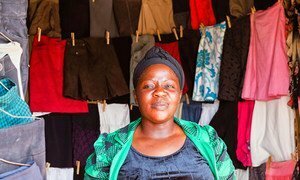 The UN deputy chief cited the World Bank in detailing how women’s equal participation in the labor force had the potential to unlock $160 trillion for sustainable development reinvestment. “Yet a stark reality prevails: more women than men live in extreme poverty,” she continued, adding that the worldwide pay gap stands at 23 per cent, and gender roles have been too slow to change. Ms. Mohammed pointed to the benefit of reaching SDG 5 — for the more than 190 countries around the world who signed up to the Goals in 2015 — which calls for gender equality and women’s empowerment. “I often call it the ‘docking station’ for all the goals,” she said, flagging that Spotlight builds on civil society leadership and aims to address some of the imbalances women face. Some of the violence takes place due to the broader insecurity that women face, particularly where they are advocating for women’s rights. Ms Mohammed also underscored the UN’s commitment to lead by example by empowering women within the Organization itself, working towards – for the first time in UN history – full gender parity in the Senior Management Group and among those nominated to be Resident Coordinators, the UN’s team leaders on the ground. “We have a long way to go. But we have a plan and we have the will,” she stressed.